Today, when you order "Mind Reading by Kenton Knepper - Book", you'll instantly be emailed a Penguin Magic gift certificate. You can spend it on anything you like at Penguin, just like cash. Just complete your order as normal, and within seconds you'll get an email with your gift certificate. Walk into a room, coffee shop or on to a stage and begin writing impressions. No set-up or pre-show required. No gimmicks or gaffs. No sleight of hand. Write out impressions and have spectators acknowledge your uncanny accuracy. The method? It's mental. Just KNOW things a mentalist ought to be able to know. 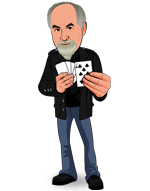 We give you remedies that will fix a very common problem in mentalism. What is the downfall for most mentalists will become a subtle and powerful strength for you. If you want to be believable, you must know about this principle. We supply you with many options at last. Be able to do very accurate readings with no set-up or inside information. Not just "cold" reading, but truly different approaches you can combine with standard methods too. Write down thoughts about a person you have never met and know you will always end on a hit. Make deliberate, detailed and secure impressions completely impromptu and amaze onlookers at your accuracy. Expanded and updated classic information you will want if you do readings or mind reading. New routines and tricks plus original physical methods are revealed throughout. More than a few of these effects have been performed on television by various personalities around the world. This material can be performed in a living room, a coffee house, pub, platform, close-up, cocktail parties, informal gatherings and even on the full stage.